Tomorrow, June 11th, 2010 is the first day of perhaps the most important sporting event in the world: the FIFA World Cup. Every four years, nations from across the globe compete to be named best on Earth at the world’s most popular sport: football (AKA soccer, here in the US). Over the past few weeks, I’ve received tons of emails from readers requesting World Cup outfits, and for good reason: it’s not always easy to dress to watch a sporting event while still preserving your sense of style! Fortunately, it’s not impossible either – all it takes is some creativity (and maybe a Youth-sized jersey or two). Although it would be impossible to create outfits for all the teams, I chose the four teams that I thought would have the largest number of CF reader fans: the US, England, Australia, and Brazil. 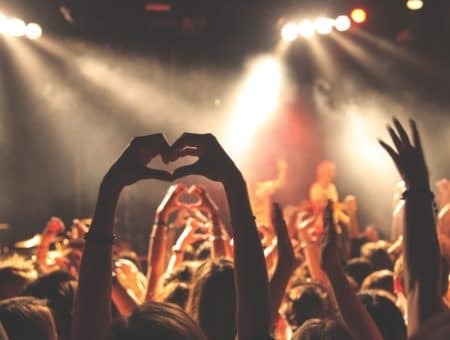 Without further ado, here are some outfit ideas that will have you supporting your favorite team without sacrificing your sense of style! Since almost 70% of CF readers are American, Team USA is obviously going to be the favorite around here! And as such, I created two outfits to give you ideas for what to wear while supporting the home team. 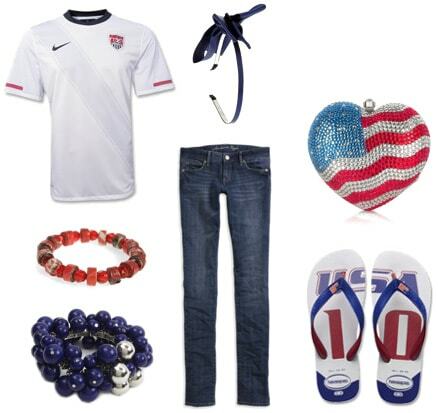 This look is probably the closest to what I’ll be wearing on Saturday to watch the US vs England game at the House of Blues in Boston with my boyfriend and hundreds of other fans. I already have my US Home jersey (youth size medium, since they don’t make women’s jerseys), and am planning to rock it with skinny jeans and plenty of fun accessories. The key to making a piece of guy’s clothing (or a young boy’s, in the case of this jersey) work is to pair it with feminine accessories – like some standout bracelets, a fun headband, and/or an interesting clutch. 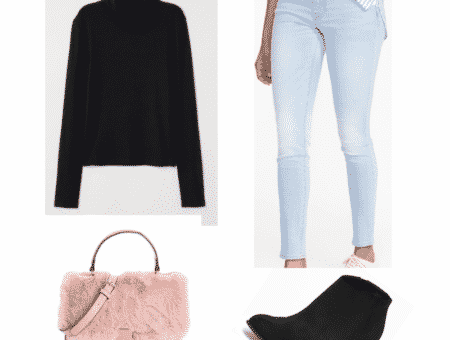 You could also pair it with a feminine piece of clothing – in this case, I went with skinny jeans, but you could just as easily tuck the jersey into a high-waisted skirt or wear it over a mini as well. Finally, I finished this look off with a special edition pair of World Cup Havaianas – too cute to resist. For this look, I paired a fun lacy skirt from Delia’s with a simple striped tank for a look that screams USA. Next, I added a white cardigan in case it gets chilly, and some nautical chic sandals with a red strap to echo the red in the tank. Finally, I finished this look off with a few choice accessories: a special World Cup watch and necklace and a classic chain strap bag, for a fun outfit that will set you apart from all the other fans. Since England is the third most popular home country among CF readers, it was only fair to make an outfit for our many amazing English readers as well (even though you guys are going down on Saturday… just sayin’). This outfit is all about dressing to support your home team without looking like you just walked into a sports shop and bought up whatever t-shirt and scarf they happened to carry. We can do better than that! After all, England is one of the most stylish countries in the world, and a boring outfit would not do it justice. For this look, I started with a special World Cup tee from French Connection, featuring three lions, a symbol of English soccer. Since the tee is a men’s shirt, it will be a little loose and drapey – perfect for wearing over a cute pair of denim cutoffs. Next, I added motorcycle boots to channel the summer boots trend and keep your feet dry in case of rain. Finally, I tossed in some special accessories: an “England” lunch bag (okay, fine: it’s not a functional purse, but it’s SO cute), a special World Cup necklace complete with football and whistle, and some red flower studs. Just throw this look on and you’ll be ready to hit the pub, or just your friends house, to watch a few games! According to our traffic stats, the fourth most popular country for CF readers is, of course, Australia! Although there seems to be less World Cup-specific soccer gear out there for the Socceroos in comparison to the other countries featured here, it’s still possible to dress well AND look like an Australia supporter with a little effort! For the Australian look, I had fewer World Cup-specific accessories to use, so I decided to create a look around the main colors of Australia’s national team: green and gold. A pretty gold dress with a floral print is offset by a kelly green cardigan (if you want to get fancy, you could belt the cardigan over the dress) and a simple pair of woven flats. An adorable I Heart Aussie Soccer backpack matches the cardigan and adds more green to the look, while a charm bracelet featuring Australian coins and an “A” ring will show everyone where your allegiance lies – even if you’re watching the game from your study abroad location in Paris. For this look, I wanted to create something fun and outside the norm, so I again focused on the main team colors: for Brazil, it’s all about green, yellow, and blue. A blue body-con dress is flirty and fun; layer a Brazil soccer scarf over it to add interest and keep warm in case the A/C is blasting. Next, add a few unique accessories: I love this Brazil soccer cuff for its fun aesthetic, while the Adidas bag is a soccer classic. Finally, if you’re daring, slip on a pair of comfy (and cute) wedges to add height and make your legs look mile-long. Not a heels girl? Rock the official footwear choice of Brazil: Havaianas, of course! 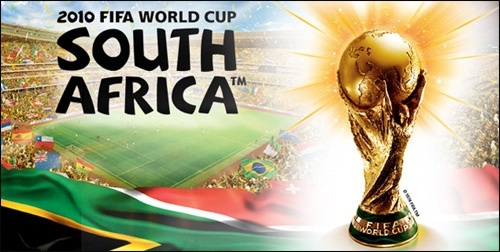 Are you going to be watching the FIFA World Cup this year? Who’s your favorite team? And what will you be wearing while you cheer your team on? Tell me all about it by leaving a comment below!